Renegade documentary filmmaker Ramin Farahani, whose latest film is banned in his home country of Iran, sat down with students at Oxford University’s Chabad-Lubavitch center for a Friday night Shabbat meal. The get-together two weeks ago at the David Slager Chabad Jewish Student Centre came two days after “Jews in Iran” was screened at Oxford Brookes University nearby as part of the Oxford International Film Festival. The Friday-evening discussion, meanwhile, accompanied a dinner of traditional Persian foods. “The event highlighted the pride of a community who have held on to their Jewish identity for 2,700 years, and still hold onto their Jewish identity in the face of an overwhelming Islamic society,” explained Rabbi Eli Brackman, director of Chabad at Oxford. Frieda Brackman, who runs the Chabad House with her husband, said that a Jewish student and an Iranian Muslim student worked together to bring Farahani to the film festival. Stopping by the Jewish center logically followed. While the plight of Iran’s Jews may be illustrated by statistics – just more than 98 percent of the country’s 69 million people are Muslim – their day-to-day lives are obscured by the lack of access granted outsiders. In making his film, Farahani sought to cast the community in a positive light, a not-so-easy task given official state policy against Israel and its various crackdowns on Jews since the 1979 Islamic Revolution. “Students heard firsthand how a non-Jewish, young Iranian overcame very difficult challenges in order to explore the lifestyle and practices of the Jewish community in his country,” said Brackman. Speaking by telephone from the Chabad House days after the event, Farahani said that while filming, he was greeted with suspicion by both government minders and local Jews. 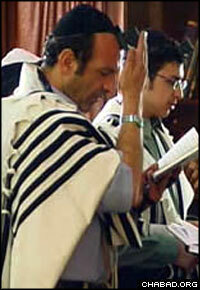 A member of Iran’s Jewish community prays in Farahani’s film. One of the elements of Jewish life brought out in the film is the complete separation between Jews and the rest of Iran’s citizens. In scenes shot in Iranian schools, Jewish students can be seen sitting apart from Muslim classmates. And although Farahani received approval to produce the documentary, such scenes likely played into the government’s decision to blacklist the film. Farahani said that he chose to examine the Jewish community, one of the oldest in the world, because it was so unknown to him. While growing up, he never knowingly met a Jew. And although as a film student, he had his first contact with Iran’s minority population, he was only aware of Armenians at the time. Dating back to the period just before the destruction of the First Temple in Jerusalem, Iran’s Jewish community numbered approximately 150,000 people at the time of the Islamic Revolution. But in the revolutions immediate aftermath, 75 to 85 percent of the community fled, primarily to Israel and America. Some left because of actual violence, while others left because of the fear of what could come. Today, between 20,000 and 25,000 Jews live in Iran, most of them calling Tehran, with its 11 synagogues and large Jewish library, home. Relative periods of calm have been interrupted by the government’s demonizing of the community, as in 1999, when 13 Jewish men were arrested in Shiraz for allegedly spying for Israel. Farahani said that making the film caused him to reflect on his own experiences, which included being jailed at 16. “I identify with the minorities in Iran, because growing up, I felt that I didn’t agree with the majority-view of things, and I left the lack of tolerance for anyone who is different,” he explained. Estaban Hubner, a Jewish doctoral student at Oxford, said that he was inspired by the film’s portrayal of a community struggling to maintain their traditions despite oppression and fear. “When you think about it,” he said, “we who live with so much freedom don’t take advantage of it. They have to struggle so much, and yet they keep so much and have such a rich faith. Nesi Benisti, a graduate student at Oxford University whose mother is from Iran, felt that the film, though sympathetic, left many questions unanswered. “You can see that the questions are not always answered directly,” stated Benisti. “The people speaking are afraid of something. It is a nice movie, but there is more to say than what was said.